Commercial seaport in the ken of the same name, Japan. Of its Jewish community most of the members emigrated from Russia. In the year 1894 a synagogue (Beth Israel) was founded by R. H. Goldenberg with the cooperation of S. D. Lessner. The latter had shortly before, with the assistance of M. Ginsburg, bought a plot for a Jewish cemetery. Goldenberg, it may be incidentally mentioned, married a Japanese widow, who, together with her two sons and one daughter, has embraced Judaism. Recently (1904) two Christians embraced Judaism of their own accord. In 1901 a Jewish benevolent society was founded to provide aid for poor Jews at home and abroad. S. D. Lessner, the founder of the institution, is its president. 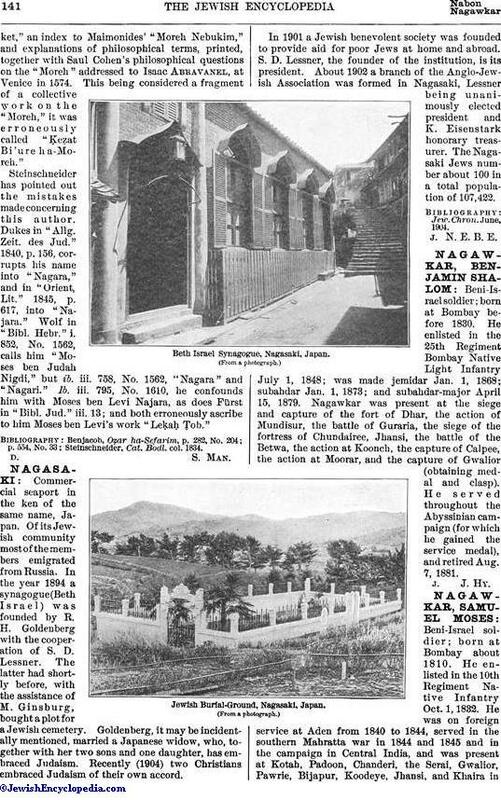 About 1902 a branch of the Anglo-Jewish Association was formed in Nagasaki, Lessner being unanimously elected president and K. Eisenstark honorary treasurer. The Nagasaki Jews number about 100 in a total population of 107,422.